Cooking can be a crazy endeavor. Even if you’re not working in a crowded space there is so much to deal with: the mess of pots and pans and cutlery, needing to chop, boil, mix and bake. The risk of cuts and burns are a real problem. When you’re flustered to take out Sunday dinner’s roast out of the over, with family all around and limited space, the last thing you want to happen is to burn yourself in the process. It’s not an easy thing to avoid with regular ovens, but with a Neff oven, you can avoid this catastrophe all together. Curious as to how? Keep reading as well go into an in depth slide and hide review in this article. Before we go further let’s go into detail what makes a Neff oven special and how it works. Specifically, we will be going over Neff slide and hide oven for the USA. Neff ovens have a lot of features that make them better than your generic ovens. They are definitely more of a professional type and are not as cheap. That being said, it is worth it if you find yourself using your oven a lot. The average oven, depending on the type that you are going for, costs roughly $2,000-$5,000. We will go over the different types of ovens that you can get and how the features can benefit you. This oven is especially good for people who have smaller spaces for which we will explain why. This feature allows you to open the oven door, then slide it underneath the entirety of the oven. The best part of this is that while you’re busy checking the status of your food or taking it out of the oven, you can make sure that the door is completely out of the way, making the chances of you burning your arm as you do a balancing act of keeping the door open and taking that turkey out is zero! This feature allows you to keep your food moist during cooking by steaming the food in a very mild way that will not hinder the taste or texture. This feature is especially good for roasts or casseroles that can get dried out while being cooked. It’s especially handy because it has three different settings that allows you to make sure everything is perfect. No one likes cleaning their oven, and usually when you use the self-cleaning feature in an oven you tend to get burned areas that don’t adequately get disposed of. Pyrolytic self-cleaning is perfect because if gives you three different settings that allow you to access the amount of mess your oven has. After you press the cleaning button and allow the allotted time to clean, simply wipe out the oven with a paper towel. This is a great healthy way to cook your vegetables. This is a steamer that runs on a liter of water that is easily refillable and then administers a perfectly administered amount of steam in order to cook the vegetables evenly. This feature is a fan that administers heat to evenly cook food for up to four different trays depending on the oven that you have. Theses are the different features that you can get in your oven, but whether or not you get a specific feature depends on the oven that you get. Let’s go over some of the best Neff ovens. Keep in mind that each of these ovens include the slide and hide feature. Description: Affordable price for such a professional functioning oven, this item uses circo-thermal technology in order to evenly cook multiple meals at once. Twelve different functions allow you to perfectly cook whatever food you want, including doughs, meats, cakes, ect. There is even a grill feature to better cook your meats. This oven has a sleek design that offers up to 71 liters of space and does require professional installation. Description: A dark, sleek and modern oven that’s simple interface offers a plethora of cooking options. 71 Liter capacity, fitted with telescopic shelving which can accommodate even the heaviest dishes. This oven requires professional electric installation. Description: This oven is complete with circo-thermal cooking which allows for maximized food being cooked. This is a perfect oven for those who bake a lot because it gives even heating. Also this oven has a hot air grilling that allows for thorough cooking that makes sure to cook all the way through without losing it’s moistness. It is a beautiful oven that is made of stainless steel and allows for 71 liters of space. This requires professional installation. Description: This is a modern looking, stainless steel oven that holds up to 67 liters. It offers three different cooking options so that you can cook a whole array of foods. This includes a defrosting setting to make your cooking experience as easy as possible! This product heats quickly, cooks evenly, and cleans easily. It does require professional installation. Description: Black, sleek, simple design, yet offering a large array of cooking options, this oven gives you a lot to work with. 71 liter in capacity, this large oven gives you up to three levels to cook. Oven with the Slide and Hide door, Circo-therm for even cooking, eco-cleaning for easy, self-cleaning, bottom cleaning for the floor of the oven, and navigation control for simple use of the control panel. This product, like all Neff ovens, requires professional installation. Are Neff Ovens available in the United States? A frequently asked question is, are neff ovens available in the united states? And the answer is Yes. You can get them on Amazon in the USA. Why Should You Buy A Neff Oven in USA? There are many reasons that you should try out a Neff oven. Let’s summarize. 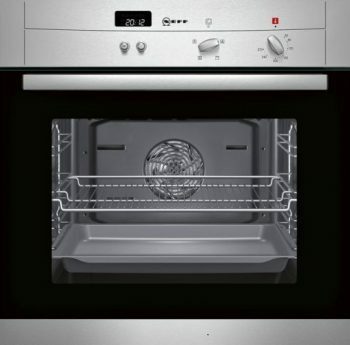 Firstly, on a superficial level, Neff ovens are always sleek, modern, and simple look. The stainless steel or black items can make sure that it always blends well with your kitchen. Another great aspect about Neff’s products is the plethora of special options that the give you. You have to make sure that specific options are a part of the oven you’re looking at. Of course we specifically want to look at the ovens with the slide and hide oven door. This is one of the most innovative and unique features that Neff offers. It causes removal of food to be easy and safe. For specific cooking needs you have the circo-thermal that evenly cooks as well as specialty steaming if you want. The self-cleaning feature also causes your cooking and cleanup to be easier than ever. Perhaps the most important thing is that this product is made well. Time and time again customers rave about the quiet, quickly effectiveness of their Neff oven. Food comes out even cooked, moisture intact, and taste at its ultimate best. This product is mainly a UK based one, and that might make it difficult for you if you want to get a Neff oven in the USA. But it is possible to own your own Hide and Slide oven if you look in the right places. Unfortunately it is not available on their website as a USA option. This is because their products requires professional installation which is not a popular type of oven in the States. That being said, it is not impossible for you to get your hands on one of these amazing ovens. If you go onto Ebay you will be able to find Neff ovens. You can also contact the Neff Canadian headquarters and have their product shipped to you to the States. (800-268-4527). It might be a bit more of a headache in order to get your hands on a Neff oven, and it might even be more difficult because you need to get it installed. But don’t let this dissuade you, getting it installed isn’t that hard. The cost is rounded up from $98-$182. Considering some ovens are as cheap as around $450, then it’s a totally doable thing. Ultimately, if you want to have a quality, long lasting, and professional looking oven, then this is an investment you want to make. The Slide&Hide feature is unique and life changing in terms of cooking. Out of all the pros and cons of the several slide and hide oven reviews, it’s clear that the pros outweigh the cons. Neff ovens are definitely an investment you want to make. Where is USA are Neff wall ovens sold? I am very interested in purchasing but would like to see one. FYI, the company listed in Canada does not carry many of these items.